We support the London Palestine Action call for mobilisation against the UAV Engines Factory on 6 July 2015. UAV Engines is a subsidiary of Israeli drone maker Elbit Systems. Elbit were responsible for the vast majority of drones used during last year’s “Operation Protective Edge” which was so horrific, NGOs described it as a “war on children”. We’ll be at Common House, Bethnal Green, London on Friday 24 April at 8.30pm for the Occupy film night – this month screening the film ‘Arms Trade on Trial.’ After the film there will be an informal discussion and social. Please join us then and share! In defiance of corporate pressure, the film Arms Trade On Trial has been released, which documents our attempts to hold arms dealers from the DSEi arms fair to account for the promotion of illegal torture weapons. DSEi (“Defence Security Equipment International”), is the world’s largest arms fair, and takes place every two years in East London. It is jointly held and heavily subsidised by the British government. DSEi has hosted arms companies from more than 50 countries, with around 1500 exhibitors registered as selling arms, missiles, fighter aircrafts, tanks, military electronics and warships, as well as surveillance and riot control equipment. At the last DSEi arms fair around 30,000 buyers and sellers came from countries such as Saudi Arabia, Turkey, Bahrain, Israel, Mexico and Colombia. 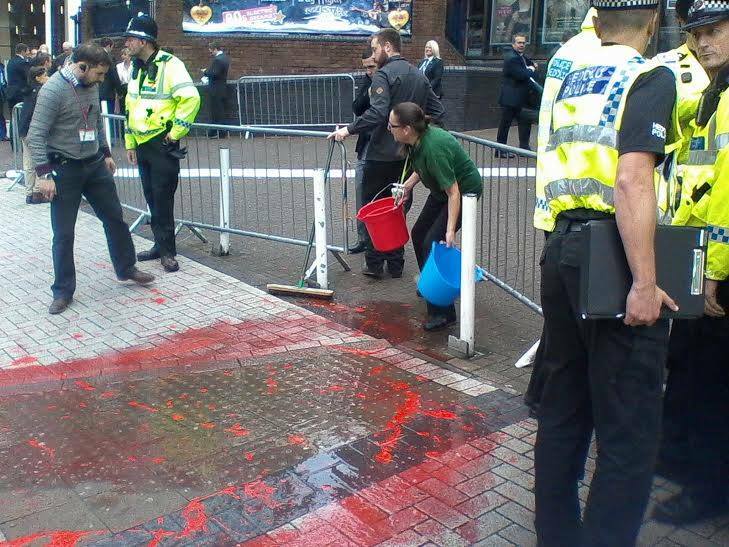 Anti-militarist activists and peace campaigners have engaged a diversity of tactics to disrupt the arms fair. 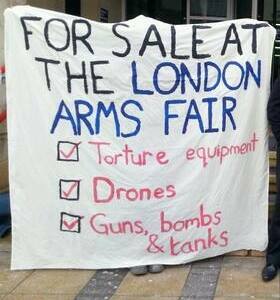 At every DSEi arms fair since 2005 , illegal weapons have been promoted for sale . This includes weapons designed specifically for torture, as well as cluster munitions and anti-personnel landmines. At the last DSEi event, two companies (Tianjin MyWay International of China and Magforce International of France) were identified as promoting illegal torture weapons including fetters, electric stun batons and stun guns. In the absence of any meaningful response from the state, a group of activists (having ourselves faced criminal charges for disrupting the arms fair) sought to privately prosecute the arms dealers for the promotion of illegal torture weapons at DSEi. The arms companies were compelled to attend court, and the matter proceeded as far as being listed for trial. However, following intervention by senior directors at the CPS, the case was unexpectedly shut down. In defiance of pressures not to speak out about what happened, the film Arms Trade On Trial has been released. We oppose not only ‘illegal’ weapons, but the sale of arms for corporate profit more widely. We sought with our proceedings to shine a light on the true nature of the DSEi arms fair, and to highlight the state’s relationship with the arms trade, allowing it to operate with immunity. The state’s behaviour as concerns our case (both a failure to investigate and prosecute arms companies that have promoted torture equipment, as well as its role in preventing others from holding them to account) is illustrative of their longstanding complicity in fuelling torture and conflict. Since the state clearly cannot be relied upon to stop the torture and killings, it is no wonder people feel that the only effective course is direct action. The DSEi arms fair is currently set to return in September 2015, and it will once again bring together repressive regimes and fuel conflict and human rights abuses. More information about the forthcoming mobilisation against DSEi 2015 can be found on the Stop The Arms Fair website. Arms Dealers on Trial film to be screened at CAAT National Gathering 2015! A film has been made which exposes the corrupt history of arms fairs in the UK, in particular it focuses on the private criminal prosecution we brought against arms companies Magforce International and Tianjin Myway International, before it was shut down by the British State which protects arms companies, allowing them to breach the law on arms control with impuinity. Please please do share this witness appeal on to any individuals or groups that you think may be able to help. Yesterday Corporate Watch made public a damning dossier on French Arms Dealers Magforce International – the company we had sought to privately prosecute for displaying illegal torture weapons at last year’s DSEI arms fair. The dossier brings to light the company’s alleged links with mercenaries and warlords, as well as ‘how the firm flourishes in a culture of impunity, flaunting arms controls across the globe’. MagForce was thrown out of London’s Defence Sales and Equipment International (DSEI) arms fair in September 2013 for exhibiting brochures that included electric stun guns/batons and leg restraints. In September last year we took part in a mass action against the world’s biggest arms fair (DSEI) which happens at the Excel Centre in London every 2 years. This event is co-organised by the Government and Clarion Events. DSEI 2013 featured 1,500 exhibitors (including Israeli companies), promoting arms such as torture equipment, tanks, fighter jets and battleships. Attendees included representatives from many countries involved in human rights abusing regimes. This video – made public for the first time – shows one of our actions to disrupt the setting up of the arms fair. A group of female activists blockaded an access road into Excel, by halting and holding the space under an HGV trailer that was attempting to exit the site. The DSEI arms fair is scheduled to return in September 2015. We will once again be there, along with many other groups, to tell them that they and their killing machines are not welcome. For more information and to find out how to take part in the mobilisation against next year’s DSEI arms fair we recommend visiting the Stop The Arms Fair website. Last Friday (4th July 2014) our friend and fellow DSEI 2013 arms fair blockader Dan Ashman represented himself in court against an obstruction of the highway charge. The court heard how Dan had gone to the arms fair with the intention of upholding the law and establishing the area as a crime scene, and that the police, by facilitating the traffic of military equipment into the Excel centre where the arms fair takes place, were facilitating grave crimes, including crimes against peace. Dan’s action that day included standing in front of a coach that wanted to enter the arms fair. PC Terry Powell, who gave evidence for the prosecution, admitted under Dan’s questioning that war crimes, torture and murder were, in fact, crimes. However, when asked about the crimes that had taken place at the DSEI fair during DSEI 2013 and previous DSEI arms fairs, the officer said that such matters were ‘political’ and only the Home Secretary or Prime Minister could order investigations about such matters. Incredibly, the PC Powell claimed to be unaware of the revelation in Parliament bu Caroline Lucas MP about illegal torture weapons being promoted at DSEI 2013, about this leading to two arms companies being thrown out of the fair, and our private criminal prosecution of these arms companies. Our lawyer has written to the CPS, Ministers and Police asking them to investigate this matter. It has been covered in the mainstream press and we had a considerable police presence during the first arms dealers on trial hearing in April. We have also submitted freedom of information requests to HMRC and the Metropolitan Police regarding their investigation (or complete lack thereof) of the arms companies, and are currently appealing the decision by HMRC to reveal nothing. In his closing statement, Dan reiterated that he acted lawfully and in the best interests of people all over the world. He acted out of necessity to prevent serious harm to people. In seeking to uphold the law, the police arrested him, wrestled him to the ground and applied painful pressure techniques to nerves around his throat and neck. Criminal activities are supported by our government at this time, Dan said. Dan’s integrity and dignity came through in everything he said. Another prosecution witness, DC Knightley, even wanted to shake Dan’s hand and wish him well after the trial concluded. Please support our comrade Dan at his trial tomorrow, from 9.30am at Stratford Magistrates’ Court. Outrageously, the CPS has not yet dropped the case against Dan (an obstruction charge), for his principled protest against the DSEI arms fair. Even though we were arrested and charged at the same time as Dan (some of us even shared a police van with him), and even though we took a private criminal prosecution against some of the criminals inside DSEI – Magforce International and Tianjin Myway International. Does this sound like the actions of authorities who claim to uphold human rights across the world? It’s grosteque hypocrisy from our Government.